Designed by the Hagerstown-based marketing company, the new Maryland website design for Advantage Homes provides the ultimate user-friendly experience for home buyers. The redesign is easy to update and manage, cleaner and uses newer technology. Homebuyers will find the new site faster and easier to navigate. Power Marketing, an award-winning builder marketing and internet marketing MD company, is pleased to unveil a new website for long-time client and Maryland homebuilder Advantage Homes. The redesign is easy to update and manage, cleaner and uses newer technology. Home buyers will find the new site faster and easier to navigate, plus a number of exciting new options for viewing and sharing new homes and design features. 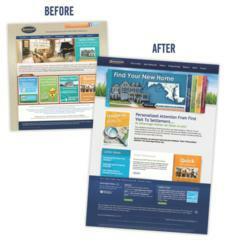 With the end user experience in mind, the Maryland website design makes finding the perfect home much easier. The site now features a Floor Plan Search where users can browse Advantage’s homes by location, price range, number of rooms and more. Similar to the search options on sites like homes.com, this helps narrow down the search to homes that are feasible and affordable. Users can also browse the photo gallery directly from the Floor Plan page, as well as the Gallery tab on the top navigation bar. With the View Specifications section in each community, users can browse and select specific features and design center options to build their décor, color scheme and finishing touches. From exteriors, lighting and flooring, to plumbing, counter tops, appliances and more, this section features photos and product descriptions that inspire home buyers to create a beautiful style that is uniquely their own. The View Area Amenities tab allows users to scope out nearby schools, restaurants and stores located near an Advantage community. The View Site Plan tab features a detailed map of each lot’s location within a community. Advantage Homes can easily and frequently update lot availability. Users can check the status of a model here and view a specific lot’s proximity to community amenities like parks, pools and walking trails. Social media plugins are featured in each community section. Home buyers can easily share a home model with friends and family via Facebook, Twitter and Google+. The updated Energy Savings section features helpful charts that compare HERS ratings, estimated annual energy costs and estimated annual energy consumption of various Advantage models. Users can click on the plan name to get a detailed energy savings report and find out which communities offer that specific plan. To see the new design, visit http://www.AdvantageHomesUSA.com. To learn more about Power Marketing’s internet marketing MD, Homebuilder websites and other brand strategy services, visit their website at http://www.Power-Marketing.com or follow them on Facebook and Twitter. Power Marketing, LLC is a full-service marketing firm with more than 20 years of hands-on experience in brand strategy, internet marketing MD solutions, SEO Maryland, marketing social media and web design. Power Marketing assists companies in maximizing their resources to improve their brand identity and sales success. For more information, please contact Communications Specialist Krista Scarlett, 301-416-7861, Krista(at)Power-Marketing(dot)com, or visit http://www.power-marketing.com.